Phi found a novel spin last week, with three clues giving long answers split over two lights. The clues were excellent in all three cases, but I wonder if I was the only one bunging some of them in from definition and enumeration alone. A bit of a hoo-ha over on Fifteensquared here with regard to 3d. Speaking as a poacher turned gamekeeper (I’ve got one in the Indy this coming Thursday, btw), I can assure you that Eimi is normally an extremely thorough editor, and I think he can be forgiven for not poring over every clue when dealing with a setter as trusted as Phi. Never guessing an error, I entered ‘numeroso’ (presuming it to be an import from the Spanish) then, when the crossers showed it had to be ‘numerous’, I thought ‘Eros’ must have an alternative version ‘Erus’. In the end (and apart from the anachronisms, which I’ve come to enjoy) it turned out to be the first out-and-out mistake in a puzzle I can recall over the last five years or so of doing the i. As for the other ‘lapse’ that caused a stir back in the day, I actually had 23a ‘Sailor leading rest in’ as a candidate for Clue Of the Day – surely when a fire is properly in, it is indeed ‘ablaze’. Well I stared at an almost blank grid for quite a while. In my defence we have visitors for the weekend and they want to chat, can’t they see I’m busy!. I eventually completed this by adjourning to a smaller more private room. 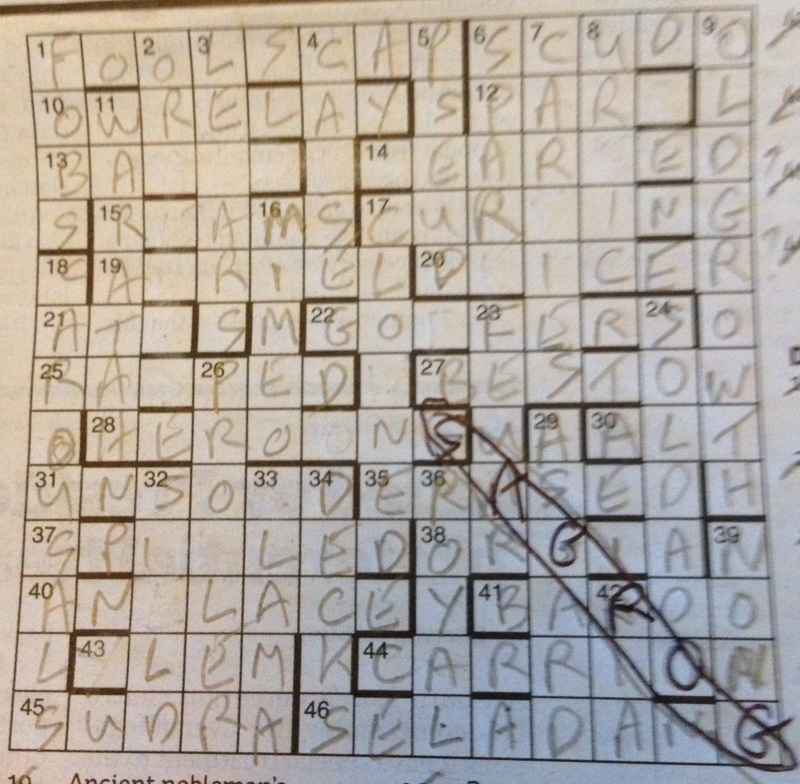 I found this quite difficult with quite a few (to me) obscurities in both the wordplay and the answers. In 9ac associating slander with mud seemed a bit tenuous , yes I know about dragging someone through the mud but it still didn’t quite work. 14ac was an unknown to me but I was pleased to be able to solve it from the cryptic part and then confirm with a dictionary. As with lots of puzzles that seem difficult out the outset ,when the are eventually completed I wonder why I found them so difficult and realise that I really did enjoy it and the clues in the majority were excellent which leaves me to select just one hmm 26ac or? An enjoyable, and not too difficult puzzle. Apparently this is a reprint from one of the Wednesdays Crosophile stood in for Dac, where it fits quite well. That said, I struggled a little in the SW corner. 18ac was new to me and, while I got the idea, I spent too long looking for something like OVER… 17d was also a little tricky. Lots of enjoyable clues today, COD going to 5ac – ‘Church leaves 19c reformer to the Creator (6)’. A little more difficult than par for Dac, I thought. Perhaps it was the handful of unfamiliar answers, or maybe just mid-week blues, but I struggled throughout, though to be fair it was an enjoyable struggle as ever on a Wednesday. 1ac I was pleased to get from the wordplay, but on the other hand I got 19ac from definition and crossing letters, but had no idea what was supposed to be going on. Should have known 18ac, but managed not to, and took too long to spot 13d as a possibility for bracelet. Lots of nice clues, with COD going to 25ac – ‘MORI employee’s camera attachment? (10)’. Bics, a setter I don’t think I’ve seen before. It’s the Easter weekend, so are we going to get something to keep us occupied for a few days, or the opportunity to get on with those jobs that (I’ve been told) need doing? The preamble looks straightforward enough, which is promising. Nothing odd going on with the clues, we’re just looking to highlight the man in question, and remove 20 letters from the finished grid. The clues are a little tricky, as you expect when there’s no jiggery-pokery going on, and there’s a fair amount of hunting through Chambers required, but the grid is filling, fairly rapidly too, though with a little trouble at the end on 19ac which isn’t in the big red book, but Google to the rescue to confirm. Nice and easy as these go, then, and time to get on with that painting. Until next week, and another delivery from Eclogue. “Here it comes”, I thought, “this is what you get for wishing out loud for something tougher last Friday” – Mordred being one of my bêtes noires. The grid looked daunting too. As it turned out, this was a straightforward puzzle for the most part, with a couple of intransigent stragglers to tidy up at the end. I hardly need say that the theme sailed straight past me, but once you know it’s there, it’s rather impressive. There’s a heavy hint in 20d which with hindsight should have sounded the alarm. For an exhaustive explantion, please see the original Fifteensquared blog entry from November 2012. Poins steps into Quixote’s shoes with a mostly straightforward puzzle. I failed to parse 23ac, and struggled with 19ac at the close, but the rest fairly flew by. A fun, not too taxing start to the working week then. Especially for those of us a bit shell shocked at having to get up at the crack of dawn once more. COD? No real stands out for me, TBH, but I’ll go with 2d – ‘What students must pay for special treatment (9)’. Just for a change Phi called himself Noz (think either Boz or ‘No Z’) when this puzzle appeared in the Independent back in 2012, the bicentenary of Dickens’ birth, but for the i we were given his more familiar nom de plume. I’m slightly embarrassed to admit that the only character I recognised was David Copperfield’s friend Steerforth. Alas I couldn’t conjure up any of the reverends, not even Reverend Stiggins, despite Pickwick Papers being one of the few Dickens novels I have read. Coming though as it did after a week of easier end crosswords though, I relished the challenge of deciphering unknown names from a combination of wordplay, crossers and guesswork, finishing off with Reverend Chadband (Bleak House) and the SW corner. And all the answers are here. I think this is the first puzzle from this setter to appear in The i, however from the comments on the other side he is quite prolific. I must say I found this a bit mundane, it started out well with 1a being a clever piece of wordplay and I enjoyed sorting out the component parts of 10a even though the answer was a bit obvious after that though the whole thing seemed to lack any sort of challenge. An enjoyable puzzle from Crosophile, with a bit of a sting in the tail, for me at least, struggling at the end on 26ac (MEAL was my random guess, until it became clear MEA didn’t mean much at all as far as the clue was concerned), 31ac (TILTED, anyone?) and 15ac – where the answer was clear enough, but the wordplay anything but. Finish time above average for the i, perhaps because I’ve yet to wake up. Lots of inventive clues, and lots of ticks too, with COD going to the quite unusual 10ac – ‘I got drunk with this rum in Tangiers (7)’.